As Kyiv lies on a hill over 300 feet high, next to the river Dnieper, transport in this city requires ingenuity. The Metro crosses the river on a bridge, but can’t keep up with the drastically steep terrain. Arsenalna Metro Station is technically still higher than the river, but lies nearly 350 feet (105.5 meters) beneath the city, making it the deepest station in the world. The largest collection of death masks in Ukraine. The escalator ride to and from the stop can last up to five minutes, which is why many locals tend to run down the dizzyingly long steps. 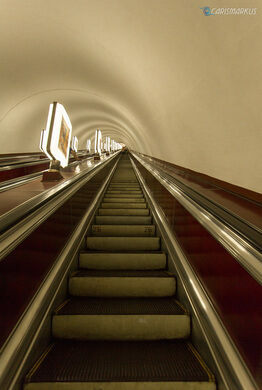 The station is so deep in fact that it requires multiple escalators and platforms just to reach it. The station was completed in 1960 and was named after the nearby Kyiv Arsenal Factory, founded in the 18th century as a production facility for the Russian army. The architecture features imposing pylons that remind commuters of the crushing tons of earth and water above their heads, but they are just reminders as they exist purely as decoration. The station lies within the Sviatoshynsko–Brovarska metro line (marked with red color on the maps). It is listed as an architectural landmark of local significance. This series of Scottish caves has no clear purpose other than baffling historians. The strange, ritualistic-seeming 100+ year old basement of a New Hampshire undergrad society.